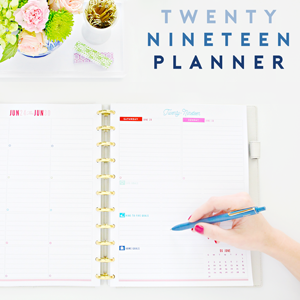 The fabulous duo behind DIY Playbook are back today to share a super sweet and simple project that anyone can do. I love that we are all so different when it comes to our lifestyles and our homes, yet today's topic is probably something majority of us have in common. Keys. 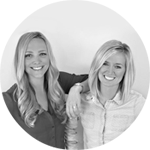 Whether you only carry a few or a whole slew, Bridget & Casey are here to share how you can create the most fabulous set of keys around. 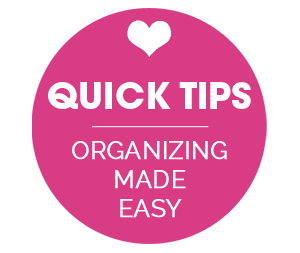 One of the things we truly love about reading IHeart Organizing, is the fact that Jen doesn't just show you amazing ways to organize your space. She always takes things to the next level... and makes them look stylish and cute too! Most everyone has their keys on them every second they're out of the house, and it seems crazy that we hadn't given this item much of a thought in the appearance department. I mean look at those keys above. That lanyard is from the mid 1990's, it's seen its fair share of public countertops & dirty floors, and has most definitely hung out with many crumbs in the bottom of countless purses. Yep, this lanyard had to go! 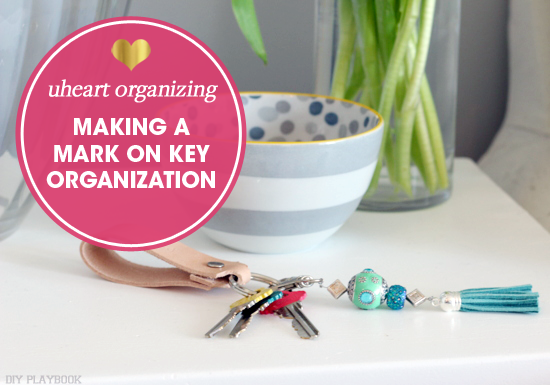 But we didn't want to stop at DIY'ing a new keychain, we also had to organize all of those keys! This is a time when you don't want to channel your inner janitor. You don't need to always have every key to every lock on you at all times of the day. Not only is it a heavy nuisance, but when you have dozens of keys on a ring it can be really hard to find the important ones when you need them quickly. So our first order of business was to create a lean, mean new set of keys. We said "bye bye" to all of the old keys and random plastic scanner tags we no longer needed, and pared it down to just the essentials. Then, to differentiate and label the keys we got out a few beauty supplies. Yep you read that correctly... beauty supplies. Turns out nail polish comes in handy in the DIY world too! Now, we're both officially awful at painting our own nails and we're so-not-trendy when it comes to cool paint colors. There's just no way these two non-fashionistas can pull off any trendy cool colors like navy, yellow, or mint green. Instead, we both only have boring reds & pinks in our nail polish collections. So, we visited the drugstore and picked up some fun, vibrant nail polish on the cheap! Only a couple bucks for all 3 of these bad boys. Then, we "labeled" the keys with the nail polish. 3 light coats works just fine. We suggest letting one side of the key dry for 24 hours, then flip it over and do another 3 coats on the other side. Don't forget to paint the edges, too. (Tip: tape off the bottom and add a layer of clear coat to protect the paint even longer.) Also, you may want to write your new color code system down, perhaps in your smart phone. Pink = bottom lock, Blue = top lock, Yellow = back door, etc. Just until you get used to the new system. Now that the keys were looking good it was time to create a new, more grown-up keychain. Step 1: Cut a strip of leather so it is 1 inch wide and 8 inches long. Step 2: This step may be confusing, and it's a bit hard to explain. The above graphic is what you want your end piece to look like. Here's how you can mark your piece of leather before you cut it. Mark 1/2 inch up from the bottom. Then mark 1/4 up from that, and 1/4 in from each side. Connect the marks, so you have 2 angled lines. Did you get all that? Sorry if it's confusing. We hope the graphic will help you along! 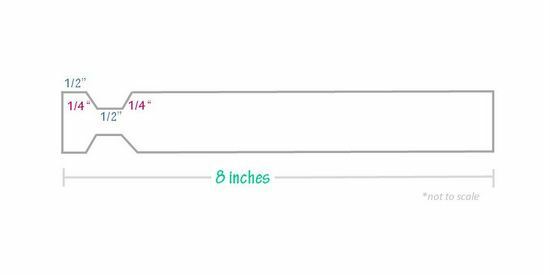 You don't need to get these measurements exact. If you're a little off it will still work! Step 3: Once you have all of your measurements, cut your leather. We used scissors, but you can also use a razor blade if you want to get the cuts perfect! Step 4 (Optional): This step is optional, but oh-so-fun. We decided to take our leather keychain to the next level (because we're fancy like that) and personalize them with a leather stamping set. If you don't want to spend the extra money on the stamp set, no worries. You still have a bomb keychain! But we definitely recommend this $15 one if you want to splurge! All you need is a hammer. Press the letter or number firmly into place on the leather and give it a few good whacks with the hammer. Boom, your leather is engraved! Step 5: Now time to use that scary looking leather hole punch tool. You may be able to create a hole using another tool (perhaps a drill? ), but we decided to go with the leather hole punch to create a nice clean hole. Fold your leather (like in the above photo) and punch a hole through all 3 layers. Step 6: Loop your key ring on the end and grab your rivets. 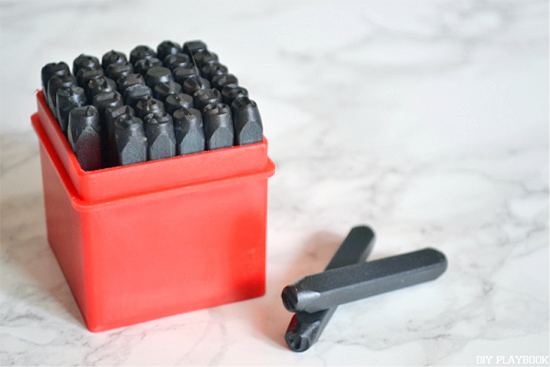 You'll want to follow the directions that come with your particular set of rivets, but it's really pretty easy! You'll just need a hammer to secure your rivet shut. So what do you think of our new-totally-grown-up-and-glamorous keychains? We love the darker leather for our guys, and the lighter leather for us. A nice way to differentiate "his" vs. "hers" when you're grabbing your keys and heading out the door! Because we had some leftover supplies (& we didn't want it to go to waste in our craft drawer) we also made a tassel for our keychain. You can get the full step-by-step tutorial on our blog at this post. We are both loving our new keychains and instead of hiding them deep in our purses, we are keeping our keys out for all to admire! "Hey There! We're Bridget and Casey, the best friends, Chicago gals, and editors behind The DIY Playbook. 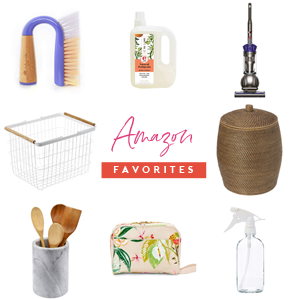 Even though we consider ourselves busy girls with full-time jobs, husbands, and never ending to-do lists, we believe there is always time to add personality to our homes. 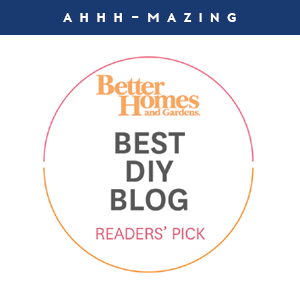 On our blog, we strive to inspire our readers to inject their sparkling personalities into their own spaces with affordable and attainable solutions. We heart Instagram, can't turn down a cup of coffee, have no clue what we're doing in the kitchen, and are beyond excited to be part of the IHeart Organizing team!" 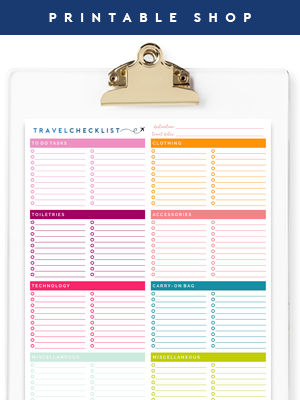 This is such a neat idea! Love it! That is such a cool idea! I love the idea of using nail polish on the keys. Such a simple solution but I would have never thought of that. Thanks for the detailed tutorial. Have a great day! So need to organize my keys this way and make my own cute key chains! Thanks for the tips and tutorial! Polka dots.... love this idea!! Thanks for the tip Gaby! I love the leather key chain and very cool that you used leather stamps. So simple to do too! Nail polish is the best for keys. This is so cute! I seriously need to do this with my keys! These are definitely, by far, the most stylish keys I have ever seen. 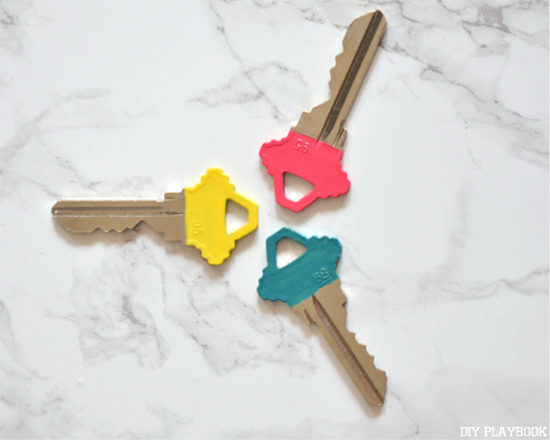 I love the idea of painting the top of the keys to add some color. P.S. That keychain is adorable! The leather keychains are super cute. Those would be a great DIY/homemade gift for Father's Day. I've painted keys with nail polish before and the polish just does not last. It's cute for a while and then it's just ugly when the polish chips off. I'd try coloring keys in with colored sharpies then clear polish over top if you really want to go the colored route. 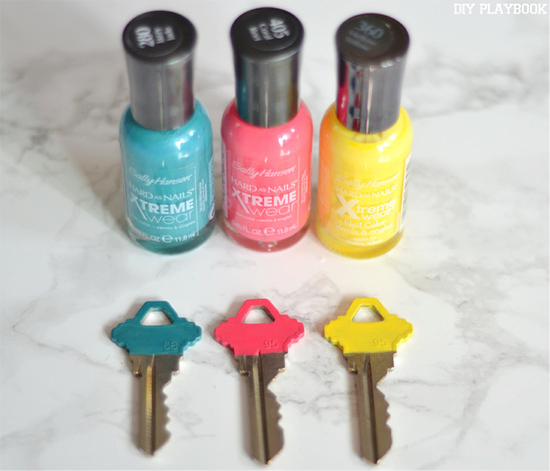 Careful- the nail polish can "melt" if you leave them in he car on a hot day and your keys can get stuck together until you are able to pry them apart with acetone. Thank you so much for sharing this tip! We will definitely keep this in mind, Mary. I love love LOVE the nail polish on the keys thing - not only does it help me tell my keys apart, it makes them look really cute, AND helps me get rid of the last dregs of nail polish. Might have to try the leather strap, it really looks cute too! what happened to the other keys? Great question! We realized after going through the key chain that most of the keys on there we didn't even need anymore! They had been collecting on our keys for years yet didn't really have a purpose anymore. Because we don't use them, we figured we definitely do not have to be lugging them around with us. So cute! I make jewelry but I've never made a keychain! I need to get on that. I know I'm supposed to be completely focused on the keychain, but that bowl in the first photo really caught my attention. I'd love to know where to get it!